What’s cool in Yellowfin 6.1? Updates to iPhone & iPad apps! Mobile Business Intelligence (BI) industry expert, Howard Dresner, believes that Mobile BI will soon become tantamount to BI itself. “This latest findings report shows strong evidence that Mobile BI is taking hold – broadly,” said Dresner, in reference to his annual Mobile Business Intelligence Market Study. “We believe that we’re in the midst of a profound shift toward Mobile BI. We believe this paradigm shift will affect everyone and have as much impact as the Internet did, over time. “The impact of Mobile BI… will change the way that we work, our ability to respond more quickly and to align towards common purpose. This notion of pervasiveness has always been the mission of BI, which may now finally be realized with the catalyst of mobile computing. Mobile BI: Why sacrifice your analytical capabilities for the sake of mobility? If this is true – and the increasing trend towards enterprise mobility suggests that it is – shouldn’t mobile reporting and analytics offer deep analytical and functionally rich capabilities akin to its desktop / browser-based counterpart? We think so. Drill anywhere functionality: Users can now utilize Yellowfin’s drill anywhere functionality on reports accessed from their iPhone or iPad. 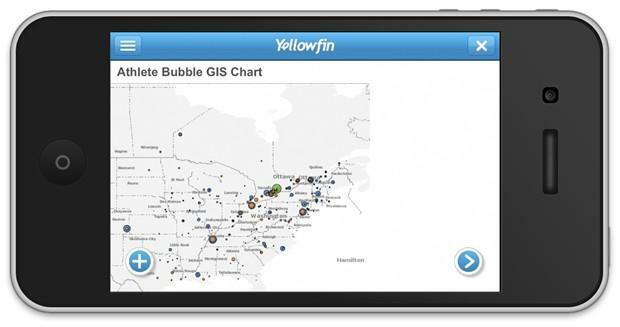 Native mapping support: Native map support has been added for Geographic Information System (GIS) maps, GIS heat maps, GIS bubble maps and Google maps, allowing users to access complex geometric reports from mobile devices. Yellowfin ‘Whiteboard’: The aforementioned Yellowfin ‘Whiteboard’ feature – What’s Cool in 6.1? Whiteboard! – takes advantage of the iPad and iPhone’s native multi-touch interface, allowing users to draw (with their finger) on a report to highlight important information, trends and outliers. This feature functions like a screen shot / capture, allowing the resultant annotation to be shared with other users.